Dare to wear pink - and we mean pink. 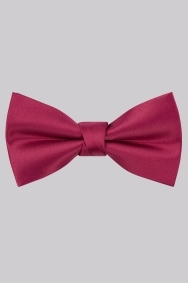 Fuchsia in tone, this bright bow tie is a statement option. It's loud and you should be proud wearing it. Moss 1851 is all about modern tailoring, and this standout piece is the bright finisher you need if you want to be the talking point at the next tux-worthy ceremony. Wear it with a tuxedo for black tie, if you're feeling a bit rebellious, or go for a three-piece navy, grey or black suit for another dressed-up occasion. A plain white shirt is a must if you want the tie to hold its own.